This tip is for Windows 7, Windows 8.1 and Windows 10. 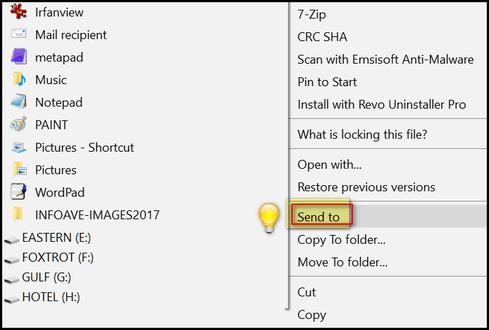 Most of you know what the Windows Send-to Menu is… when you right click a file you see a list of things and one of them is “Send to”, see? 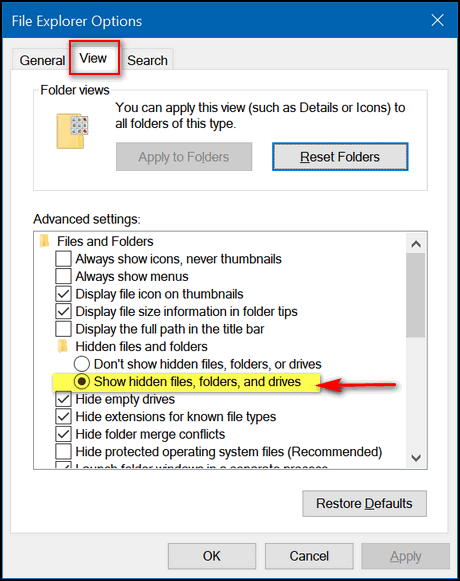 Make sure the circle next to “Show hidden files, folders, and drives” is ticked. Once you’ve done this, you’re ready to proceed. C: \Users\Your User Name\AppData\Roaming\Microsoft\Windows\SendTo . Look at the screenshot below and you’ll see a list of things that you’ll see when you right-click something and choose “Send to”. You can add almost anything to this list or remove anything from this list. 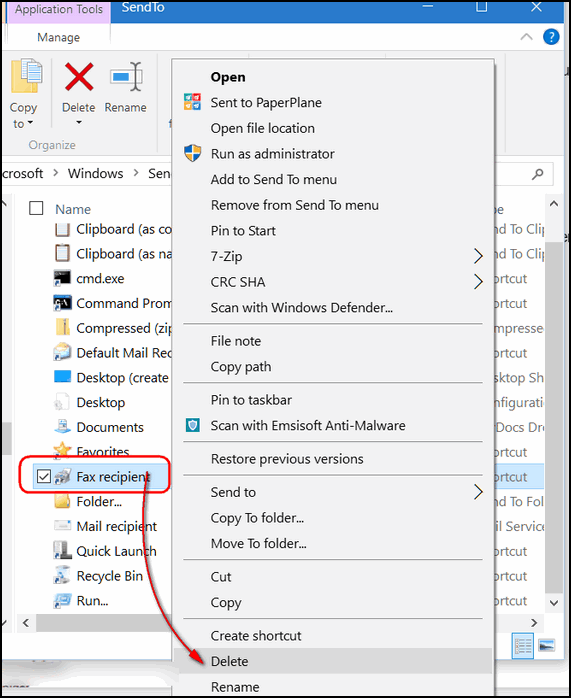 Since I deleted “Fax recipient”, from the SendTo folder above, it no longer appears as a choice when I right-click and choose “Send to”. I use a program called MetaPad — instead of Notepad — to open text files, reg files and more – but it was not on the list. To put it on the SendTo list, all I had to do to was drag a MetaPad shortcut and drop it in to the Send-to folder. (Make sure you only move shortcuts and not the program itself.) 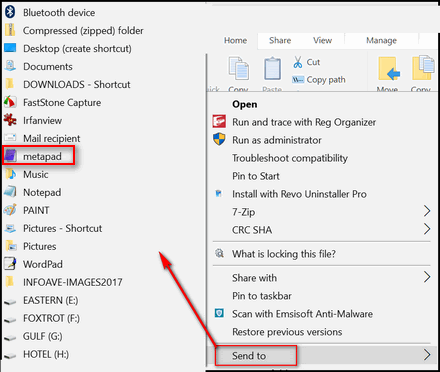 If you’re not sure, right-click in program’s folder and choose “Create shortcut” – then move the shortcut in to the Send-to directory. Now when I choose Send to, I have the option to “Send to” MetaPad (see the screen shot above). Notice also that “Fax recipient” is no longer on my SendTo menu, because I deleted it. You can drag any shortcut into the SendTo folder. You can create new shortcuts and drag them into the SendTo folder. 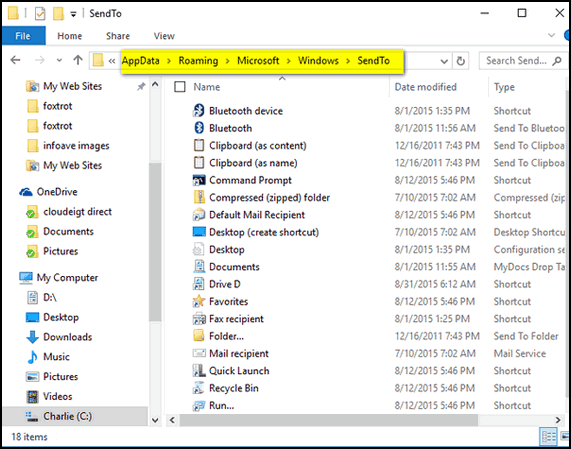 You can create a shortcut to any folder and add it to your SendTo list. If all this seems like a trifle too much maneuvering and aggravation, use can one of the many programs available to accomplish the same things as shown in this article. One of our favorites is a free program called “Sendto Toys”. Sendto Toys makes it a snap to add, delete and modify items to/from your Sendto menu. You can read more about Sendto Toys here. Now, it’s time to make a shortcut called “Sendto EB”. I’ll send her all my work – send her yours too!